The circumstances of his death were as follows. A fairly mild attack of uraemia had led to his being ordered to rest. 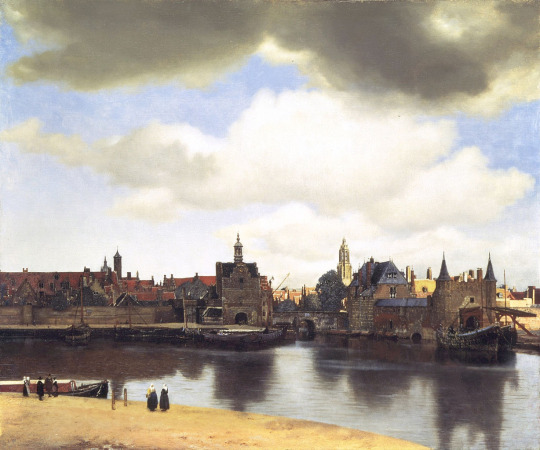 But, an art critic having written somewhere that in Vermeer’s `View of Delft’ (lent by the Gallery at The Hague for an exhibition of Dutch painting), a picture which he adored and imagined that he knew by heart, a little patch of yellow wall (which he could not remember) was so well painted that it was, if one looked at it by itself, like some priceless specimen of Chinese art, of a beauty that was sufficient in itself, Bergotte ate a few potatoes, left the house, and went to the exhibition. At the first few steps he had to climb, he was overcome by an attack of dizziness. He walked past several pictures and was struck by the aridity and pointlessness of such an artificial kind of art, which was greatly inferior to the sunshine of a windswept Venetian palazzo, or of an ordinary house by the sea. At last he came to the Vermeer which he remembered as more striking, more different from anything else he knew, but in which, thanks to the critic’s article, he noticed for the first time some small figures in blue, that the sand was pink, and, finally, the precious substance of the tiny patch of yellow wall. His dizziness increased; he fixed his gaze, like a child upon a yellow butterfly that it wants to catch, on the precious little patch of wall. “That’s how I ought to have written,” he said. “My last books are too dry, I ought to have gone over them with a few layers of colour, made my language precious in itself, like this little patch of yellow wall.” Meanwhile he was not unconscious of the gravity of his condition. In a celestial pair of scales there appeared to him, weighing down one the pans, his own life, while the other contained the little patch of wall so beautifully painted in yellow. He felt that he had rashly sacrificed the former for the latter. “All the same,” he said to himself, “I shouldn’t like to be the headline news of this exhibition for the evening papers.” He repeated to himself: “Little patch of yellow wall, with a sloping roof, little patch of yellow wall.” Meanwhile he sank down on to a circular settee; whereupon he suddenly ceased to think that his life was in jeopardy and, reverting to his natural optimism, told himself: “It’s nothing, merely a touch of indigestion from those potatoes, which were undercooked.” A fresh attack struck him down; he rolled from the settee to the floor, as visitors and attendants came hurrying to his assistance. He was dead. Dead for ever? Who can say? Certainly, experiments in spiritualism offer us no more proof than the dogmas of religion that the soul survives death. All that we can say is that everything is arranged in this life as though we entered it carrying a burden of obligations contracted in a former life; there is no reason inherent in the conditions of life on this earth that can make us consider ourselves obliged to do good, to be kind and thoughtful, even to be polite, nor for an atheist artist to consider himself obliged to begin over again a score of times a piece of work the admiration aroused by which will matter little to his worm-eaten body, like the patch of yellow wall painted with so much skill and refinement by an artist destined to be for ever unknown and barely identified under the name Vermeer. All these obligations, which have no sanction in our present life, seem to belong to a different world, a world based on kindness, scrupulousness, self- sacrifice, a world entirely different from this one and which we leave in order to be born on this earth, before perhaps returning there to live once again beneath sway of those unknown laws which we obeyed because we bore their precepts in our hearts, not knowing whose hand had traced them there – those laws to which every profound work of the intellect brings us nearer and which are invisible only – if then! – to fools. So that the idea that Bergotte was not dead for ever is by no means improbable.